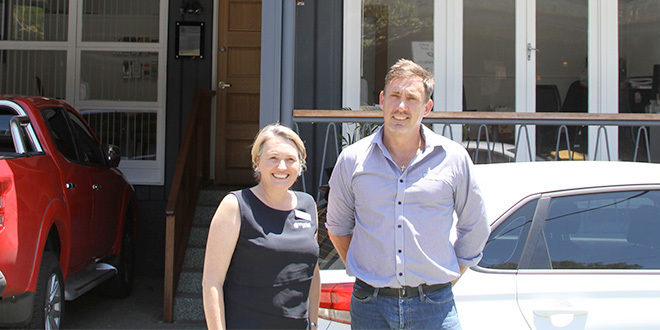 Finding homes: Cornerstone staff Michael Eklom and Melissa, outside their Gold Coast office. HOUSING shortages on the Gold Coast have put more than 1000 people at risk of sleeping without a roof over their head. According to the Department of Housing there are 1700 people waiting for government housing on the Gold Coast. Since opening its doors in 2017, the St Vincent de Paul Society’s Cornerstone program has helped more than 200 of those people. Program director Michael Eklom said the organisation had become a well-known service provider for the growing number of Gold Coast people living without homes. Cornerstone’s model focuses on sustaining tenancy and working to establish long-term tenancy for the homeless – as well as financing the arrears of rent. “We like to work from a hand-up perspective, so we want to make sure that if we’re paying rent arrears that people are able to sustain that moving forward – we’re not going to be continually paying rent for a particular person every week,” Mr Eklom said. Finding homes for people is a more difficult prospect for Cornerstone. At any time there can be up to 500 people applying for one place. “It may be three to six months of work to try and get someone who is homeless, or on the streets, help,” Mr Eklom said. “We make contact with everybody who comes through the front door. “We work pretty tirelessly to try and get to everybody we can. “So we don’t currently have a wait list. “We utilise what we can in the community to make sure that people are staying engaged and not falling off the map. “We have access to a counsellor here that’s free, so people can access counselling, if they like, on a Tuesday and Wednesday. “We also have access to GPs, psychologists, psychiatrists and legal aid. “We’ve worked really hard to make those good connections in the community, and sometimes it just comes down to simple common courtesy – returning a phone call here, or emailing someone there. Mr Eklom began his career as a landscape gardener, before completing a psychology degree. Prior to starting with Cornerstone he had worked in the mental health sector for eight years. “I’ve got a pretty solid background in working with the disadvantaged and I know a lot of people in the community and that’s obviously helped,” he said. “I enjoy it here – it’s a great organisation to work for. They’re very supportive. Cornerstone can be found at 11 Hicks Street, Southport, and operates Monday to Friday from 8.30am-4.30pm.